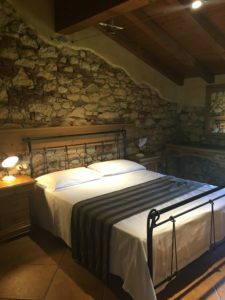 Dimora del Bugiardo–Agriturismo Dimora del Bugiardo-Via Cariano, 24, 37029 S.Pietro in Cariano (Verona), Valpolicella email: dimora@buglioni.it -This hotel is a rustic farmhouse that has been beautifully restored. This agriturismo provides an excellent included breakfast buffet. The breakfast buffet was delicious, as was the cappuccino. This is a working winery, although unfortunately they do not give tours of the winery or cellar. They produce excellent wines and sell them at a very good price, but sadly, they do not ship them. We purchased wine from them and we were able to find another winery to ship it home for us. Maria and Melissa are lovely hard working ladies running this beautiful hotel. The rooms in the farmhouse are rustic and comfortable all at the same time. 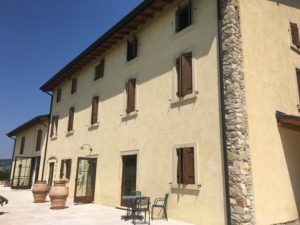 This agriturismo is located right off of the highway so it is well located and convenient to all of the local wineries and tasting rooms. They were kind enough to provide at check in a listing of local tasting rooms, salumi stores and local activities. The restaurant is two minutes away at their sister hotel and it is fabulous. They have outdoor seating on their terrace. They make their own wines, We had a truly fabulous experience at this hotel. Free WIFI in all rooms. Silvia gives and excellent tour and tasting of her family’s small boutique winery near Fumane in the Valpollicella region. Silvia is extremely knowledgeable and was kind enough to spend a few hours of her Sunday with us, which is pretty much unheard of in this area. She ships wine to the United States. Do not miss an opportunity to meet with Silvia! You will learn so much from Silvia and have a great hands on experience. You can also purchase their fabulous cherry jam! Yum! 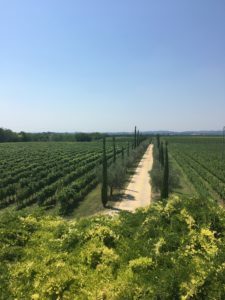 Masi Serego Alighieri-I was only able to have a tasting in a tasting room. Even though I emailed them weeks in advance I was not able to get a tour on the day that I was available due to a large tour group occupying all available appointments. There are tours of the estate that are available for 18 euros for a 1 1/2 hour tour with a three wine tasting. This is a huge winery. 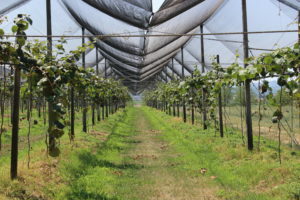 They have multiple locations and conference rooms for conferences.This is wine that is mass produced and some of their wines are available all over the world. After visiting many wineries I have found that most of the time I prefer small boutique wineries. It is my recommendation to skip this tasting room and spend your time elsewhere. A note on one way to get in to some of these wineries that may not be open to the public for tours-I am typically not a fan of guided tours, but I have heard that if you want to visit Qunitarelli it is possible to sign up for a tour with a tour company, and that is one way to get in to that very exclusive winery for a tour and tasting. I had also read that some people have just hung out outside and been invited in. I hung out outside for about a half an hour, and had no luck getting invited in! A truck that was heading down the private road of the winery did pass me, and for a fleeting moment, I did consider jumping on the back!. Who knows, maybe someday I’ll break down and sign up for a tour. II’d love to hear your stories, if you get into Quntarelli, please let me know! I’d love to hear all about it! email: locanda@buglioni.it-This restaurant is in the sister inn of Dimora del Bugiardo. This is an excellent restaurant. We ate here twice, and I could have eaten here a few more times, there were so many good things on the menu that I wanted to try! You must not miss the Ripasso Risotto. That risotto was one of the best dishes that I have ever eaten. This restaurant offers steaks, an amazing cheese plate with homemade jams, chocolate cake; every dish we had was delicious. This restaurant makes their own wine. Their Ripasso is so rich and deep in color that it was mistaken for an Amarone, by a famous sommelier. You must eat here and you must try the Ripasso! email: enoteca@valpolicella.it-Amazing food. No menu. The waiter discusses with you what you would like to eat, and he makes suggestions for you. This restaurant has largest wine menu that I have ever seen in my life! In our conversation with the waiter, we decided to do a wine pairing lunch. This was truly an amazing meal. This is a restaurant that you should not miss out on! Trattoria Rosa-Via Brennero, 21 Corrubbio di Negarine (Verona)-Allow Gabrielle to cook you an amazing steak with grilled vegetables over an open fire! This is a fabulous experience, and Gabrielle counldn’t be nicer! He even shared a selection of grappas with us after our meal. My favorite was the blueberry grappa! Yum! When doing my research for our trip I discovered that there was an opera on Saturday night while we were there, so I just couldn’t miss an opportunity to see my first opera! We saw “Madame Butterfly” and it was a fabulous experience. We sat in the first elevated level as close to the stage as we could get. It was surprisingly difficult to hear, so I would not recommend purchasing tickets too far away from the stage. We were pleasantly surprised when the opera started and we realized there were screens on either side of the stage that had all of the words in english on them! Prior to the opera my husband and I both read a synopsis of the opera, so that we would have some understanding of what was going on, and that really helped us to enjoy the opera. I have a few hints for you about attending the opera. I brought a pair of small binoculars, from home, and that helped me to be able to look closely at the beautiful costumes, and even see the facial expressions of the actors, which I really enjoyed. This is a very, dressy occasion for Italians. Most men were in suits and many women were in long dresses. To make yourself more comfortable I recommend either bringing a seat cushion with you or you can rent a seat cushion for just a few euros. That definitely helped with the comfort level. I brought my own fan, but they do have them to purchase, because it was very, very hot until the sun went down. They do sell beverages, which you will probably need! Overall, it was an awesome experience. Osteria Casa Vino-Vicolo Morette 8/a, 37121, Verona. This restaurant is just a five minutes walk from the amphitheater where the opera is held. The food was very good. They provided great service. We dined outside which was really nice and comfortable, even though it was a very hot day. If you visit Verona, this is a very nice restaurant with a huge menu!